Array-based gene expression and gene dosage analyses have the potential to generate new molecular markers for many cancers, including gliomas. 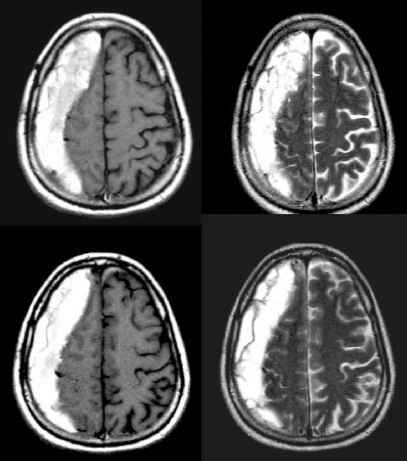 Several groups are currently evaluating these modalities in selected gliomas. Using an 1,100-gene expression array,Watson et al. have identified 196 transcripts that are associated with oligodendrogliomas of different grades.33 Similarly, two groups have used 12,000-gene arrays to discover differential expression of a limited number of transcripts that can be used to classify high-grade gliomas.34,35 Array-based comparative genomic hybridization (CGHa) likely will lead to the discovery of novel gene dosage alterations that can be used to classify gliomas.36,37 Importantly, the markers (and marker panels) ascertained by these methods will have to be carefully validated. However, there is the exciting possibility that a limited number of protein or genetic markers could be developed to enhance the molecular identification of gliomas, and potentially to standardize neuropathologic diagnosis. Much of the current translational research in gliomas is focused on developing therapeutic approaches that target specific protein or genetic alterations, or both. The expression array studies described above have, as one goal, the identification of new drug targets, but current research already has identified promising targets for novel therapeutic approaches. For example, several components of the receptor tyrosine kinase pathway are altered in gliomas: EGFR is overexpressed, PTEN is mutated, and AKT2 is activated. Small molecule inhibitors, immunotherapeutic modalities, and viral therapeutic agents are currently being developed that target this pathway (for examples, see References 38 and 39) and are currently being tested in glioma patients. Other pathways also are being targeted for novel therapeutic approaches. The design of current and future trials will need to develop the concept that therapeutic approaches will be customized to the molecular alterations found in specific tumors. Clinical molecular pathology will play an important role in this customization of clinical neurooncology practice.